External hard drives are USB or Firewire devices of various capacities and form factors with hard drives connected internally to the device. However, the external hard drive itself can sometimes mask the signs of a mechanically damaged hard drive. When a USB or Firewire device is attached to a PC we hear the familiar chime and witness Windows telling us a USB Firewire external hard disk drive has been attached. We all now assume that we should be able to access our data without any further ado. Unfortunately, while the external hard drive has been recognized, it is not always the case that the hard drive itself is working. The hard drive is the only moving part in your computer other then the fan. This is what stores your data, not the USB device it is attached to. If you are having a problem with your external hard drive such as Windows asking to format it, look at the bottom of this page for solutions to recovering your data off of an external hard drive. Yep, your data is spinning around on magnetically charged platters at 5400 R.P.M to 7200 R.P.M and the read/write elements that sweep over your data on these platters are never to come into direct contact with them, Yikes! So, when the clients who call us and are genuinely confused as to why Windows has detected their USB device yet the hard drive inside is not seen in Windows or any other operating system, we try to explain the following. The USB device is a device in itself, it would be detected with or without a hard drive connected. When the device and the drive inside are working correctly the file system on the hard drive would be visible as a drive letter in your system. Sorry, not to ignore MAC users the drive would be seen on your desktop. If the drive is making noise the problem is obvious. The drive is mechanically damaged. Whenever a hard drive is clicking or strange noises are emitting from a hard drive STOP and power down. Conversely, if no noise is detected, the following steps can help you recover data. For our MAC users go to disk utilities and see if the drive is seen in the utility manager; if so you can use the repair process to try and repair minor file system anomalies. If this does not work there are a few good data recovery software utilities such as Disk Warrior or Data Rescue. 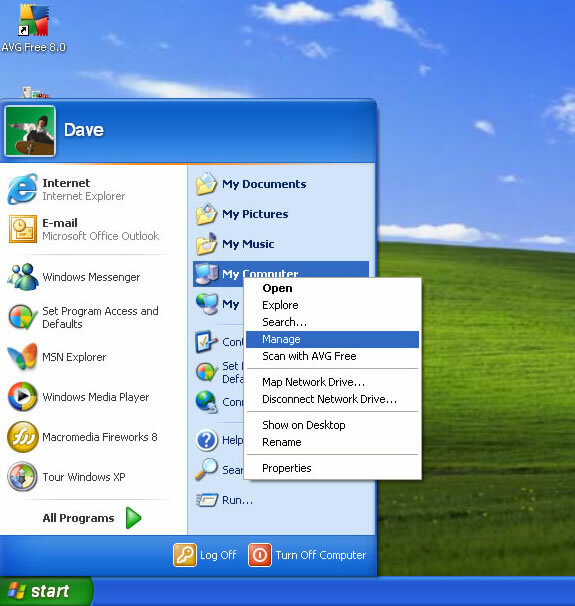 Now for our Windows users; go to the start menu and highlight the My Computer icon then right mouse click. A drop down dialog box will appear. One of the options will be manage, click on that option. Another window will open and an option on the left tab will be Disk Management, click on that option. You should see a healthy blue system drive for your C: drive. If you see your external drive is there in black it may say- Unallocated. This would indicate that the drive is working; however, the file system is damaged. The partition sector may be lost or other soft anomalies may have occurred. Now, you use data recover software to try and recover data. A foot note to this article is prudent. Sometimes your external hard drive may show up in Disk Management but may still be mechanically damaged. Often there is a problem with the read/write assembly. There is usually more than one platter that holds data and each platter usually has one head reading each side of the platter. Therefore, a drive with two platters usually has four read/write heads. You can have a drive with one bad read/write head. You can also have a hard disk drive where the head(s) are reading slowly and about to completely stop working. If at any time you begin to experience excessive read errors stop the process as this may cause catastrophic damage to the platters. Remember once the platters are damaged your data can be lost forever. If you need External hard drive data recovery give us a call at 727-345-9665. DTI is a preferred data recovery partner of Western Digital. If you need Western Digital hard drive data recovery you will recieve a discount. If you follow the Western Digital hard drive data recovery link above you will get the discount code you need to recive your instant rebate, there is also a link to WD’s partner page that verifies we are in fact a authorized data recovery company by them. Like everything in life, the solutions to your problems depend on the situation. When it comes to issues with external hard drives, a lot depends on what the problem is. The first thing that needs to be figured out is if the problem is a physical problem, in other words there is a mechanical problem with the hard drive itself, or a software or logical problem. In some instances, there might be a problem with the USB or Firewire case or enclosure, not the hard drive. That is why the first step if your external hard drive is no longer seen or recognized by your operating system is to remove it from its case and attach it to your computer either as a slave right on your IDE chain, or through another USB enclosure. How To Slave A Hard Drive In Your Computer - this article and video shows you how to slave your drive to a desktop computer using your IDE chain. How To Slave a Laptop Hard Drive Using a USB Enclosure - this article and video shows you how to use an external enclosure to slave a laptop hard drive. This will be what you have to do if your damaged external hard drive has a small form factor (or laptop 2.5 hard drive). If you have a full size 3.5 form factor hard drive, the video will still be worth watching, just ignore the part about using an adaptor. If you want to know what a form factor is visit our Hard Drive Form Factors Explained article and video. If your computer recognizes your external hard drive, but there is a problem seeing your data you can use our data recovery software to retrieve your files. We have 2 versions that will get your data back. If you accidently deleted a file then we have freeware data recovery that can undelete the files. If your problem is more severe than you will need Recover It All, the only professional grade data recovery software that works with FAT 32, the file system on all external hard drives. You can download a demo of Recover It All here. It will show you that it recover your data before you buy it! For more information about DTI Data visit hard drive recovery. I have an Iomega external hard drive with a Seagate Model ST31000340AS inside. It stopped working and is not recognized by my Windows Vista laptop. When it is powered up, it makes a gentle buzzing sound every few seconds. I have disconnected power to this unit.